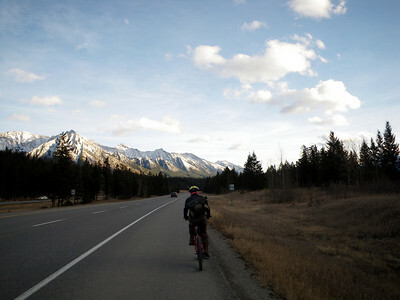 So apparently it’s largely uphill along the highway from Canmore to Banff. Only 700 metres gain over 25km or so. Gradual enough to make you think it’s flat, and that you’re just really unfit – until you turn around and go the other way. 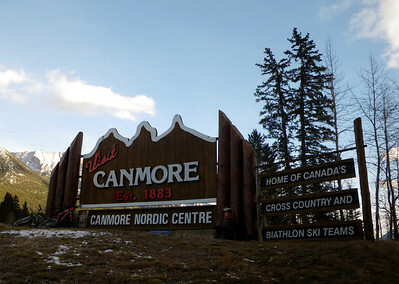 Despite the cool temperatures on Thursday (it was around minus 13oC at 11am, I don’t know that it got much warmer), we went Banff-wards by bike – largely to go and see the new Warren Miller movie (Children of Winter, much better than other Warren Miller movies I’ve seen in recent years). Friday morning brought fresh snow to telemark in, and then the homeward-bound cycle (with the added bonus of a brand new balaclava, which led to much more warmness).